Sara Whykes is one of our medical secretaries and your first point of contact at reception in our Fitzroy location. Sara has previously worked in Ophthalmology and Plastics specialist rooms and has extensive experience in numerous other sectors of the healthcare industry. 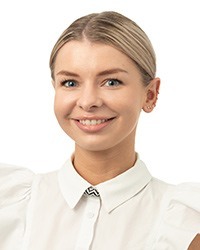 Sara is delighted to assist our patients with any administrative needs they may have including: scheduling consultations with our surgeons and healthcare staff; booking investigations or test and providing valuable information about our services. Sara is committed to provide our patients with a seamless and positive customer service experience. In her spare time, Sara enjoys being out and about with her friends and watching documentaries.